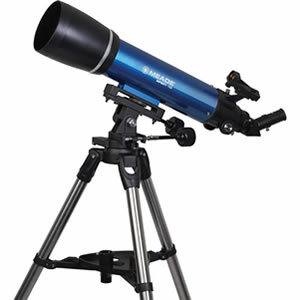 Designed for beginners, the Infinity 50mm f/12 Alt-Azimuth Refractor Telescope from Meade is intended to introduce viewers to astronomy by giving them a complete set up for viewing the Moon, planets, and meteor showers. Its manual alt-azimuth mount has an altitude lock and slow-motion controls for precise tracking of subjects. Three eyepieces provide 30x, 50x, and 150x magnifications with a 2x Barlow lens that doubles the magnification of each eyepiece for a wider-range of observing possibilities. 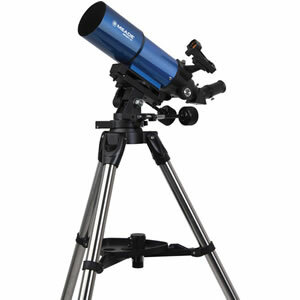 Adjustable height from 29" to 50"
Designed for beginners, the Infinity 60mm f/13.3 Alt-Azimuth Refractor Telescope from Meade is intended to introduce viewers to astronomy by giving them a complete set up for viewing the Moon, planets, and meteor showers. Its manual alt-azimuth mount has an altitude lock and slow-motion controls for precise tracking of subjects. Two eyepieces provide 31x and 89x magnifications with a 2x Barlow lens that doubles the magnification of each eyepiece for a wider-range of observing possibilities. 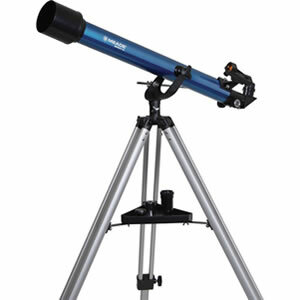 Designed for beginners, the Infinity 80mm Alt-Azimuth Refractor Telescope from Meade is intended to introduce viewers to astronomy by giving them a complete set up for viewing the Moon, planets, meteor showers, and brighter deep-sky objects. Its manual alt-azimuth mount has an altitude lock and slow-motion controls for precise tracking of subjects. Three eyepieces provide 15x, 44x, and 63.5x magnifications with a 2x Barlow lens that doubles the magnification of each eyepiece for a wider-range of observing possibilities. 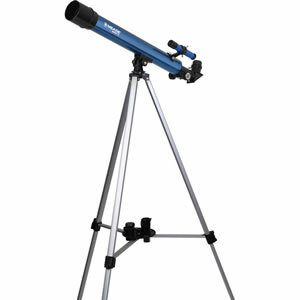 An adjustable-height stainless steel tripod provides a stable platform for sky-watching, and the included 90° erect-image diagonal makes looking through the scope more comfortable, especially when aiming the telescope toward the zenith. The diagonal's prism corrects images horizontally and vertically, allowing the scope to be used for terrestrial viewing as well. An integrated dew-shield helps to prevent condensation on the objective lens, while blocking stray terrestrial peripheral light from interfering with celestial observations. 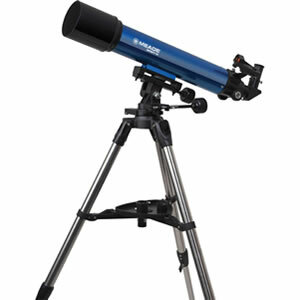 Adjustable height from 33" to 51"
Designed for beginners, the Infinity 90mm Alt-Azimuth Refractor Telescope from Meade is intended to introduce viewers to astronomy by giving them a complete set up for viewing the Moon, planets, meteor showers, and brighter deep-sky objects. Its manual alt-azimuth mount has an altitude lock and slow-motion controls for precise tracking of subjects. Three eyepieces provide 23x, 66.5x, and 95x magnifications with a 2x Barlow lens that doubles the magnification of each eyepiece for a wider-range of observing possibilities. 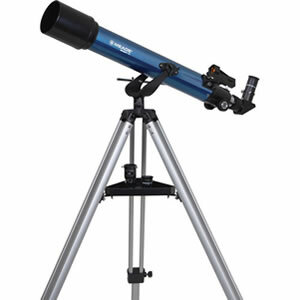 Designed for beginners, the Infinity 102mm Alt-Azimuth Refractor Telescope from Meade is intended to introduce viewers to astronomy by giving them a complete set up for viewing the Moon, planets, meteor showers, and brighter deep-sky objects. Its manual alt-azimuth mount has an altitude lock and slow-motion controls for precise tracking of subjects. Three eyepieces provide 23x, 66.5x, and 95x magnifications with a 2x Barlow lens that doubles the magnification of each eyepiece for a wider-range of observing possibilities.